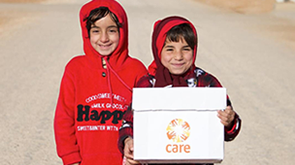 CARE has worked in the Philippines since 1949, when it became the first developing country where CARE started development programmes when we expanded our remit beyond helping people recover from the impact of World War 2. The Philippines is extremely vulnerable to natural disasters, so a major focus of our work is to help communities prepare for and respond to emergencies. We work in partnership with the government, private companies, NGOs and local community groups. Our work includes climate change adaptation and mitigation, natural resource management, disaster risk reduction, and developing early warning systems and response plans. Our Lendwithcare programme works with local microfinance institution partners to offer loans to people in poor communities who are starting or building up a small business. Find out more about Lendwithcare and how you can make a small loan directly to an entrepreneur in the Philippines.